Goodness, I haven't done one of these since Mabon 2015. A full year of no altars. Believe me when I say it was torture, but my poor altar fell apart upon moving from the Witchy Cottage to the 30 Day House. The constant moving and saving for a new house prevented me from buying a new one for a long while but here we are! Midwinter is the sabbat of darkness transforming into light, a period of calmness and reflection before growth. The solstice marks the longest night of the year before he days slowly lengthen in preparation for warmth, planting and renewal. My altar reflects the meaning behind the sabbat through the items I've utilized on it. Up front, eight lit candles sit, representing the eighth sabbat of 2016. The number eight itself holds meaning for the upcoming year: A balance of the material and the spiritual. 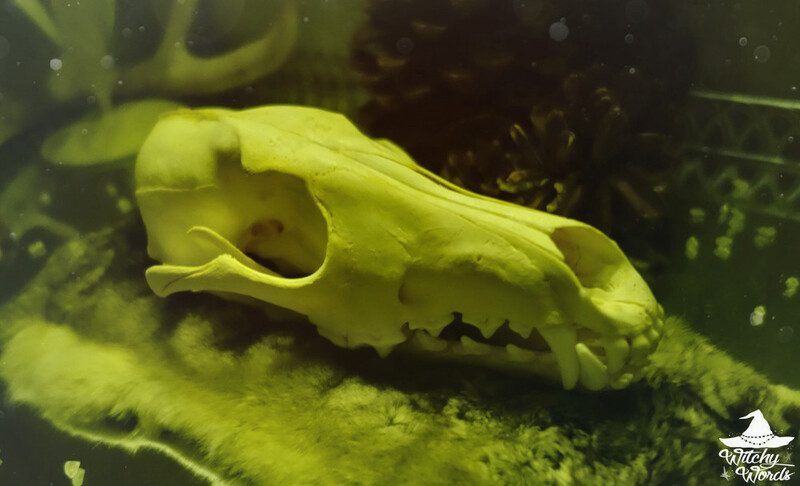 In the middle of the altar sits a coyote skull, representing the transformation of the season and the still calmness of death. It sits upon chinchilla fur, beckoning understanding of this transformation as well as warmth in the midst of the cold. Spread about the altar are shards of quartz. Quartz often represents healing, a natural process that occurs in the body when we sleep. Winter is a time of hibernation, of sleep, of healing before growing and moving. Behind the quartz sits dear antlers. Deer are markers of the spirit, the calmness of winter and of regrowth as they shed their antlers for new ones. These deer antlers surround white and glass floral candle holders. The glass represents reflection and ice while the white represents snow and bone, purity and cleansing. Springing from the white and glass candle holders, springing from the ice and snow, are green taper candles. The green represents the vegetation under the snow, the dormant growth awaiting the warmth. It also represents the prosperity and abundance we hope to have throughout this season and, of course, in the warmer months to come. Hanging over the altar is a wreath with snowflakes dangling from the bottom. Snowflakes represent individuality, cleansing, tranquility and transformation. Under the snowflakes sit pine cones, marking the fertility and potential under the snow outside. Glass beads and LED lights decorate the wreath. These LED lights are in contrast with the candles below. 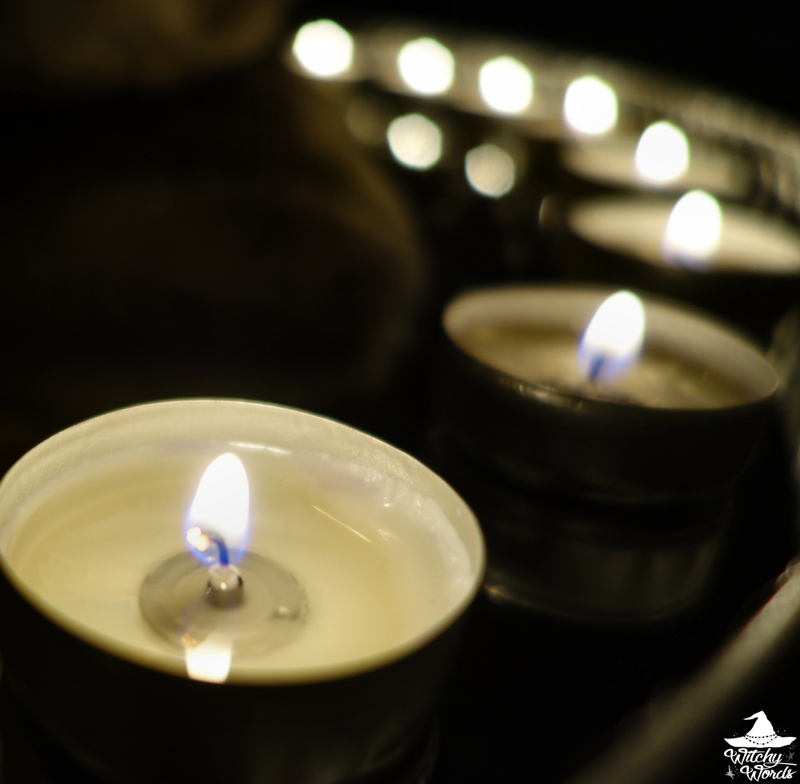 The candles are natural light, like the sun, while the LED lights are man-made, like the lights we use during the long nights. In addition, these lights flicker in quick motion, representing the busy bustling of humanity during the hectic holiday season. 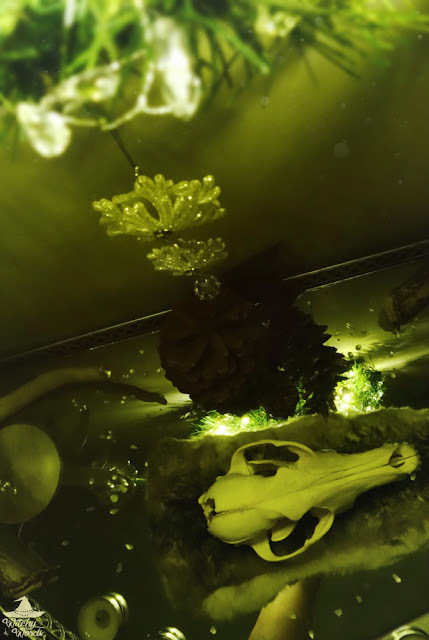 The altar takes on an eerie, dormant green color, an unnatural color. This view of the altar is relevant given that we spend more time in the dark using unnatural lights than in the natural sun during the winter. It changes the tone of the altar entirely, from warm and inviting to somber, dead, pensive. And there you have it: My first altar since Mabon 2015! I hope you've enjoyed it. For quick reference, I'll leave you with a visual explanation of the altar below. Enjoy! 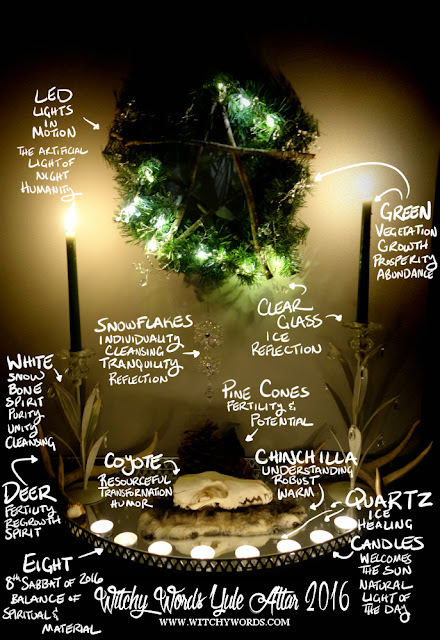 This altar is so simple in the "materialistic" aspect, but with your details of each item it holds SO MUCH and represents more than if you had a lot of items. Less is more, always. Love it!! Thank you so much, Di! The altar is smaller than I'm used to, but I'm liking the more minimalist approach! Very lovely and simple! I like it! 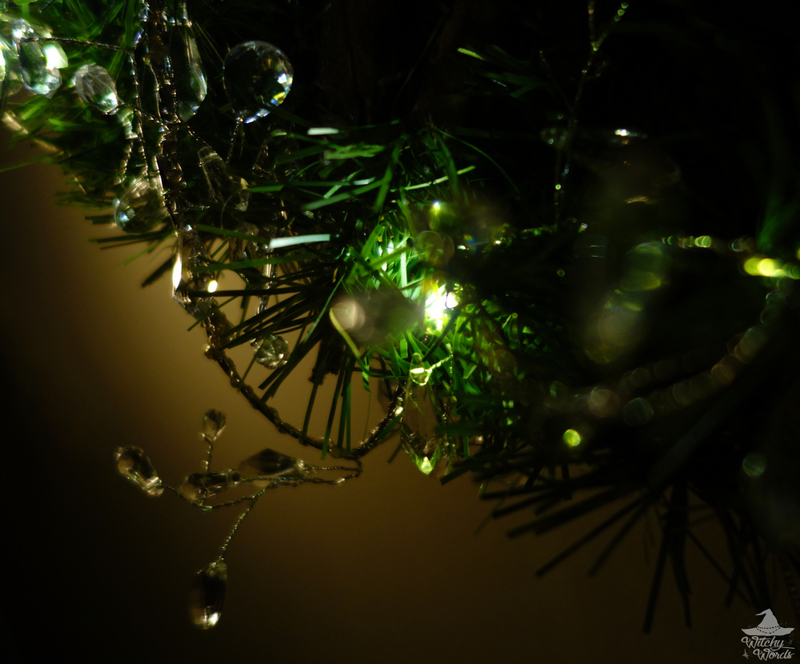 I hope you and yours have a wonderful Yule! Thank you, Willow! You as well! I think this is my favourite Yule altar you've ever done - possibly because it reflects a lot of the feelings I've had over this winter so far. Thank you so much, Vixxia! I'm actually super thrilled with my new altar. I don't miss my old one at all!